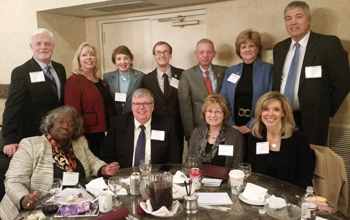 On Jan. 23, members of the college Board of Trustees met during a legislative reception with county delegates in Annapolis. The legislative reception was part of the Trustee Leadership Conference. Pictured from left to right, back row: College President Dr. James Dr. Ball; Delegate April Rose; Delegate Trent Kittleman; student Thomas Putnam; Delegate Haven Shoemaker; Delegate Susan Krebs; Board member David Bollinger. Seated left to right: Board Chair Diane Foster and Board members David O’Callaghan, Mary Kay Nevius-Maurer, and Kelly Frager.